Maya wants to be class monitor and nothing seems to go right for her. She runs late, speaks her mind, always loses things and has tough competition from perfect Nidhi. Then she does become monitor and does lose the most precious thing she has been given to take care of! 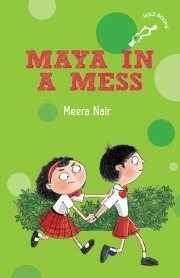 Meera Nair’s delightful story Maya in a Mess is even more delightful thanks to the lovely illustrations by Priya Kurian. We caught up with Meera to find out more!! tgbc : Where do you find inspiration for children’s books? MN : From everywhere, really. Sometimes from my own past. Like all writers I cultivate my own memories, and I’m fortunate that some have stayed so vivid. I have an essay out soon in Scroll, where I talk about an incident in my own life that inspired Maya in a Mess. 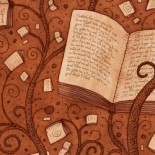 Dreams, a certain feeling, a phrase in a book. I listen to kids talking. I eavesdrop shamelessly on my 9 year old niece Anaia–she’s says the smartest, most surprising things and I love hearing about her friends and their adventures. tgbc : Your books are set in India, and your kids are growing up in the US. Do they relate to the books and the situations? MN : Kid. One. Girl. Anokha is 15 and my first reader–she’s very critical but often on-point. I also read the manuscript of Maya in a Mess to my niece Anaia last year, and she laughed in all the right places– so that was good. My books are set in an urban setting, in the every day life of a Indian child in a big city, which is really not that different from urban life here. There are visits to the mall and birthday parties and busy working parents in both countries. Childhood fears and mishaps are universal too, and I traffic in those, although mildly since I’m writing for younger kids. For instance, children everywhere have at one time or the other thought they’ve lost their parents in a crowd–which is what happens in a story in Maya Saves the Day (my first book with Duckbill), or been scared because they made a mess of some big responsibility they’ve been given. The threats in my plots could happen in any country. What is different is the fact that I get to use language and details — like the wedding band (baraath) or the batata vada song in Maya Saves the Day that are specific to India and that is what makes writing these books so much fun. tgbc : Who is your favorite children’s author? MN : This list will probably change tomorrow. Among Indian children’s authors I love Anushka Shankar’s style–she has such a fine-tuned sense of fun and I’m in awe of her rhyming skills (and I’m not just saying this because she happens to be one of my editors). I like so many of my fellow writers at Hole books that it is difficult to choose. Mathangi Subramanium’s a new book, Dear Mrs. Naidu has a wry, endearing narrator and skillfully manages to blend historical context and modern inequities without ever becoming preachy. I love Roald Dahl and Jacqueline Woodson and Katherine Paterson–the list is endless and fluid. tgbc : You write for adults as well. How is the process of writing for children different, and what are the challenges? MN : Children and adults respond to the same things in writing like characters you care passionately about and are willing to follow, a fully realized world that is palpable, that you can see,feel and touch and smell, language that is fresh and surprising, storytelling that makes you want to go wherever the author chooses to take you. Obviously when I write for adults, the situations are adult, and I think a lot about installing a deep sense of discomfort, of ways in which I can unsettle the reader emotionally. With kids the challenge is getting the voice right and creating a plausible and yet unique character. Kids are ferocious critics because they don’t know how to pretend and they’ll throw the book aside if my character or the voice I employ or the scenes I’m writing are not compelling enough. Kids live in a world where every adult is telling them what to do, so I am anti-advice, anti-moralizing and work hard to not sound like a well-meaning aunty. tgbc : What do you do when you need inspiration, or have a writer’s block? MN: Read, read, read, cook–I love to cook, it gets me out of my own head. tgbc : What are your comfort foods? MN: Golgappas (panipuri), dahi vada, curd rice–yes, I’m that South Indian who lands in your house after a 17 hour flight and only wants curd rice and lemon pickle. I have to have Sichuan food at least once a week, or the world turns bleak and dark. tgbc : A favorite quote? MN :”Love is a constant interrogation” Milan Kundera. tgbc: What are you working on next? MN : I’m looking for another Maya book. I’m also working on a book of short stories for adults set in Jackson Heights, NY where I live. And an essay on fierce women for an anthology. 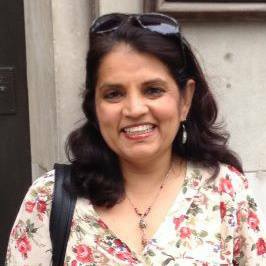 This entry was posted on August 8, 2016 by Preeti Singh in Book Reviews, Fiction, Interview, Interviews, Kids and tagged Duckbill, Maya In a Mess, Meera Nair.